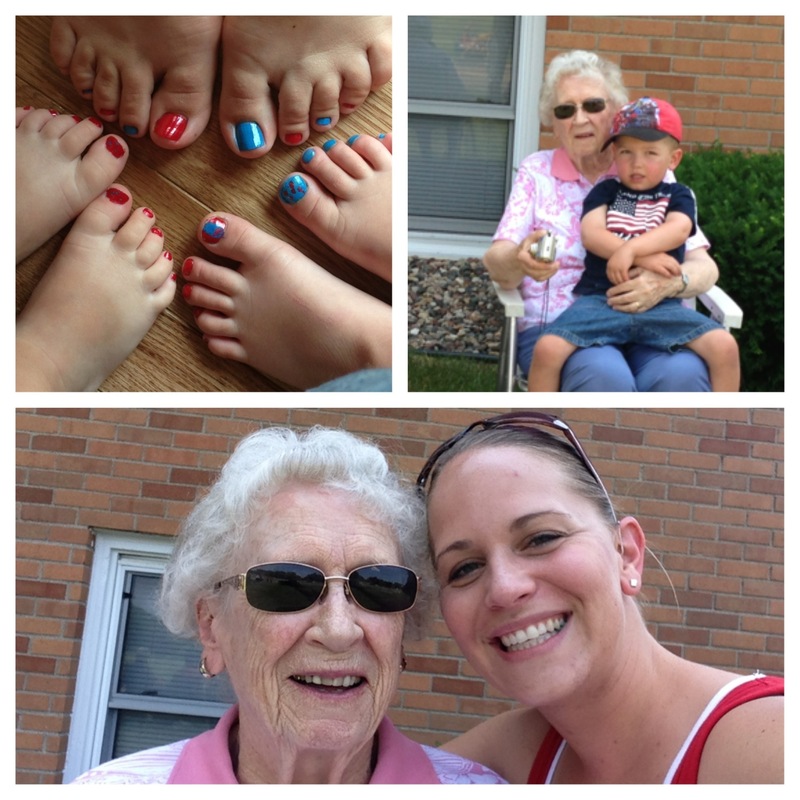 We had a great day celebrating 4th of July! Dave had to work so we didn’t see him until later. The boys and I went to Minneapolis to spend part of the day with my great Aunt Mary and Uncle Clarence. 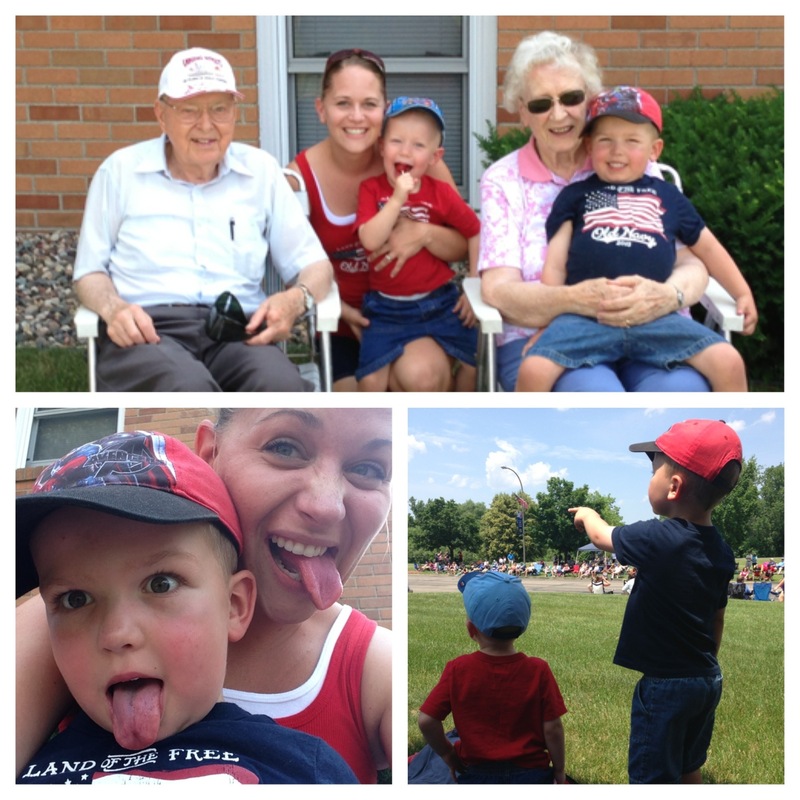 We had a picnic lunch at their house and then went to the Richfield parade. Super fun day!! Later when Dave got home we ate a good 4th of July dinner – chicken, corn on the cob and watermelon. Yum!! 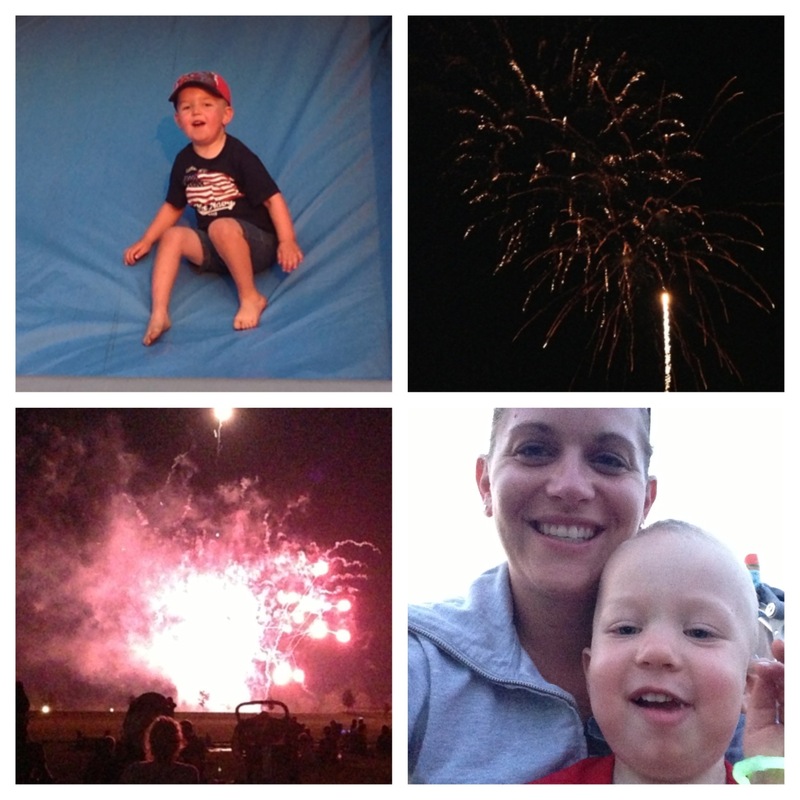 We went to the Cottage Grove firework celebration. 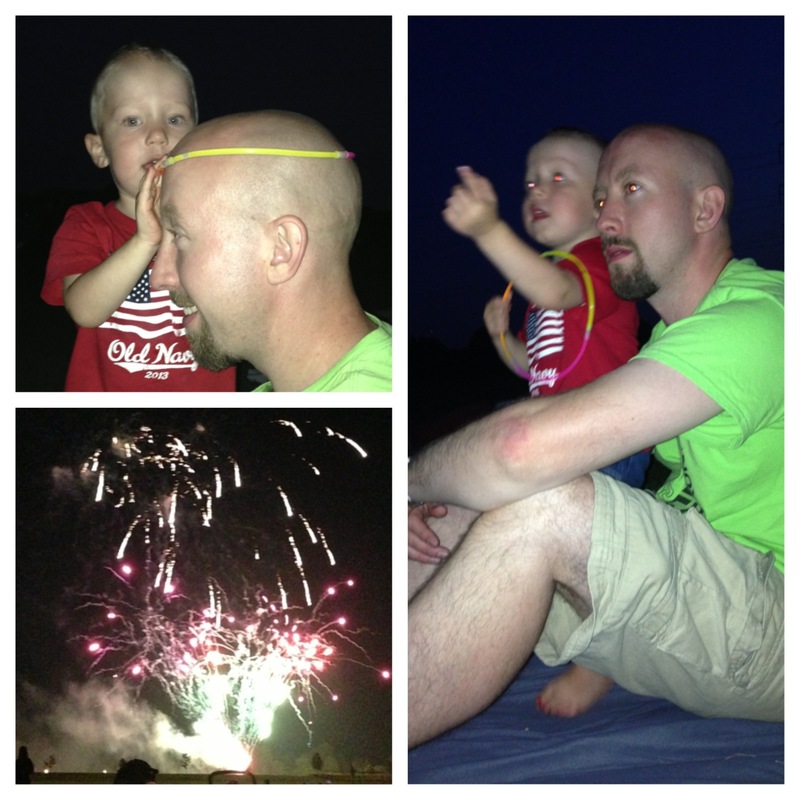 The boys had fun jumping in the bounce house, playing at the park and watching the fireworks. Noah was concerned about the fireworks getting his crackers. Eli loved playing frisbee with his glow stick bracelets. We had fun! Grand finale for the fireworks show. Amazing!! For a number of years, the Canadian Pacific Railway and the Friends in Need Food Shelf have teamed up to bring a special show to Cottage Grove. The train is all gusied up in lots of Christmas lights and decorations. There are tours available and an awesome Christmas concert. One rail-car has a drop down side, where the Holiday Train Band (I have no idea if that’s their real name) performs lots of Christmas songs. It was a cold night, but we had lots of fun!! Much to our dismay, Dave was unable to join us (he had to work), but we were joined by some friends and her family. Katie and her sweet babe, Caleb, braved the elements to come dance and hang out. Caleb brought his Grandma and Grandpa with to see the train. Katie’s Aunt Kathy, Uncle Dave and sweet, little cousin Kylie were rocking out to the Christmas music too. The Holiday Train concert. Lots of fun Christmas music for singing and dancing!! We were cold but having lots of fun!! Katie and Noah getting some warm snuggles in before the show started. The boys got glow sticks. Eli was dancing with his glow stick and “sword fighting” in the air. Mommy and Caleb snuggles. Caleb was all smiles for the camera and loved watching the lights on the train. More sword fight dancing to the Christmas music. Quick warm up snuggles!! Gotta get back to dancing! Grandma Kim and Caleb snuggles. Grandma wanted to keep holding Caleb, I think she just wanted to be warm. We went from coworkers, to near neighbors, to dear friends. Love my Katie Rose!! Noah didn’t want to be down, he wanted to be held. When he was down, he kept wandering away and asking others to hold him. Oy! He decided to be the “King of the Mountain”. Well, until another kid pushed him down, that is. We had a blast, but our toes were getting cold fast!! One last picture before we left. Here’s Caleb with his mommy and Grandma and Grandpa. He likes them! Every year around this time, I often find myself saying, “wow, the year went by so fast! !” Do you find yourself saying that too? I decided to not push myself to get our Christmas letter out before Christmas. I’m learning to slow down and prioritize more. God has given us many challenges this year but has also blessed us, very richly!! Dave had an eventful year. He started off the year working full-time for FedEx and now, has spent the past 4 months home with the boys. He is truly enjoying his time at home with the boys. Dave had surgery in July to repair a broken jaw he sustained during a softball game. He was on a liquid diet for six weeks: not fun! He has also kept himself busy with his band, My Fall Lament. They had a few gigs this fall; unfortunately, I haven’t been able to attend any yet. They are typically during the week and late at night. 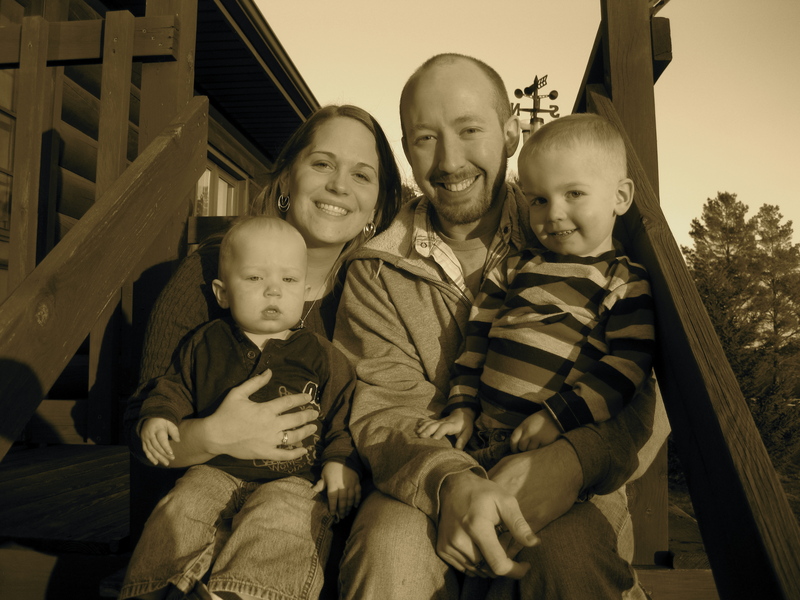 He has also spent a lot of time playing for the worship team at church—a truly blessed time. Dave and I took time to read the Five Love Languages, and now know how to better serve and love each other. He has been busy filling my ‘love tank’ by doing a lot of small projects around the house. Our laundry/storage room is almost done (in an unfinished way) and the downstairs bedroom is nearly done. Eli turned three on November 11. My baby is three!!!! He is so talkative, imaginative, busy, playful, loving, stubborn and tenderhearted. Eli has transitioned into big brotherhood very well. He does a great job of caring for and playing with his little brother. But he can be a bit of a stinker as well. He has been known to hit Noah, sit on Noah and yell at Noah…all the things big brothers tend to do. Eli had his third open-heart surgery this summer. We spent two weeks in the hospital waiting for the ‘all clear’ from the doctors. While in the hospital Eli ate A LOT of chips and salsa, fought taking his medication, played with his cars, took some naps, went for A LOT of walks and watched A LOT of movies. In looking at him now, you would never know he had open-heart surgery 5 months ago. His color is fantastic, his saturation levels are in the high 90’s and he has energy…A LOT of it. Noah turned one on November 15th. My baby is one!!! He is so much fun to watch grow up. He is so busy, so cuddly, so talkative (lots of babbling, mom, dada, up), learning to sign (more, all done, milk, eat) and so sweet. Noah has mastered the younger brother ‘annoying me’ tactics very well. He always wants to be by Eli, do whatever Eli is doing and more often than not, Eli doesn’t want him around. Noah is very curious and can be helpful…sometimes. He does a great job of taking stuff out of something, but will then try to put it back. Just this week Noah took off walking. He’s been taking a few steps here and there, walking along stuff but now he’s walking! He’s sweet and I enjoy loving on him as often as I can. I’ve been doing alright. I had an interesting year at work; I’m still work for CESA #11. I was partially laid off but then reinstated back to full-time a few months later. I dropped several districts due to caseload changes and travel a lot less this year than in the past. It’s been crazy but I still truly enjoy my job. Dad, Brianna and I celebrated Mom’s one-year anniversary by having a picnic in the cemetery with her. It was a beautiful fall day and we had a wonderful time being together and remembering Mom. As we were packing up, Brianna said, “That was fun. We should do this every year.” Dad and I agreed. I’ve had a tough year emotionally but I keep reminding myself to lean on God’s grace and to have hope in Him. It’s been a challenge, but I know He’ll bring me through it. As a family we took a vacation back in February. We went to Puerto Vallarta, MX with Dave’s parents. Just an FYI to all you travelers out there, NEVER fly internationally via standby. It seriously felt like the trip that wouldn’t end. It took us 2 days to get there and 2 days to get home. Despite travel horrors, we had a wonderful time relaxing in the sun, lots of pool time and lots of Grandma and Grandpa time. Please follow us on our blog, www.theburlingames.com. I intend to do a better job of updating our blog on a more regular basis with news, information and pictures of my sweet boys. We hope and pray you all have a truly wonderful New Year!! Here are some pictures from the various Christmas celebrations we had with our family. Eli is opening his new puzzle. Noah being his cute self! He wasn’t sure what to think about opening presents, but he had fun nonetheless. My boys opening their presents. Alexis and Eli helping Grandma make dinner rolls. Nate and his sweet kiddos – Evan and Alexis. Alexis opening her present (she got a doll bed to go with her doll that she got for her birthday). Dave and Noah watching the present opening extravaganza. Eli opening one of his many presents. Everyone helped Owen open his really big present (it was a kitchen play set). Dave put Beth’s kitchen mittens on Noah, he wasn’t sure what to think of them. Grandpa and his boys watching Star Trek. We had a wonderful holiday season. Unfortunately, I didn’t take any pictures of the Paulson Christmas gathering to add to this post. That was a ‘fail’ on my part. Next year! We are almost done with the holiday season. We have celebrated 2 of the 3 Christmases thus far, the last one will be celebrated this weekend. The boys made out like bandits this year. Characters from ‘Cars’ was a BIG hit for Eli and Noah got lots of fun toys. Of course the boys like to play with the toys the other one got, which drives Eli nuts. Eli wants to play with his toys and Noah’s toys but won’t allow Noah to touch either set of toys. We’ve been working on sharing! It was a good Christmas season but I’ve been struggling with being sad. I miss my Mom, a lot. She had the best Christmas celebration ever, in Heaven with our Savior. Selfishly, I wish she was here to enjoy Christmas with me (us). I’ve also been missing Dad a lot, I just feel comfort in being around him. We don’t need to talk or interact, I just feel comforted by being with him. Side note: I’ve decided to start blogging more and less Facebook. Feel free to check=in and follow. I’m going to post pictures, funnies, stories and things that have been on my heart. Enjoy!